The firm of Pritchett Brothers was originated in 1894 in Niantic when Art Pitchett, Sr. bought a half interest in the firm on Pritchett and Wree. At that time, Pritchett Brothers sold a full line of hardware, furniture and caskets for burial purposes. They did plumbing and heating work, and they made stove pipe and tin cans for canning purposes in their tin shop. Some years later, embalming was coming into being and Art Pritchett, Sr. took a six-week course in mortuary science, obtained his State License, which he held until his death on August 1, 1953. Art Prichett, Sr. then bought the H.M. Faith Hardware, Furniture and Undertaking business in Illiopolis. The firm then became Arthur Pritchett and Company with Joe T. Averitt as a silent partner. In 1936, Joe Averitt passed away and Art Prichett, Jr. and his brother, Joe, bought his half interest and the firm became known as Arthur Prichett & Sons. The business ran under this name until 1946 when another brother, Larry, came home from service with the U.S. Air Force and bought Art Prichett, Sr.’s half interest to his sons. The hardware business was then separated from the funeral home business. The Prichett family ran this funeral home until 1963. It was at that time that a funeral home by the name of Dawson & Wikoff ran the business until it was purchased in October 2002 by Greg and Kathy Park. 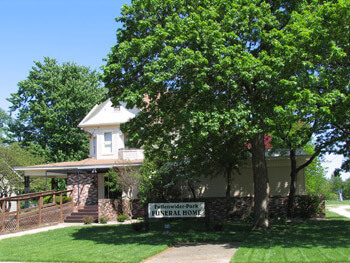 The funeral home was then named Fullenwider-Park Funeral Home.